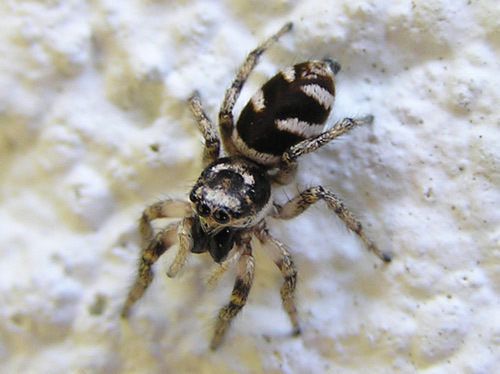 Special features: Zebra spiders are so called because of the black and white stripes on their abdomen. The males differ from the females in having large forward pointing black fangs. Zebra spiders move in short, jerky bursts. They are jumping spiders, which means they catch their prey by leaping on it. Even though they are just a few millimetres long, they can leap a distance of up to 100mm.